C. Max Schmidt M.D., Ph.D., M.B.A. 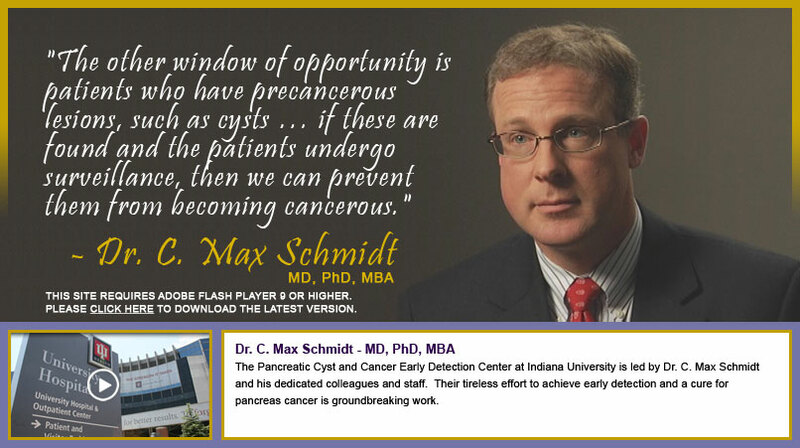 Welcome to the Pancreatic Cyst and Cancer Early Detection Center (PCC-EDC)! The PCC-EDC is located in Indianapolis, Indiana and is a part of IU Health and the IU School of Medicine. Pancreatic adenocarcinoma (pancreatic cancer) is the fourth leading cause of cancer-related deaths in the United States (US), with mortality nearly equal to incidence. Less than 5% of patients survive five years from the time of diagnosis, and pancreatic cancer is anticipated to account for 42,000 deaths in the US this year alone. This incidence of cancer-related mortality is nearly equivalent to breast cancer in the US. 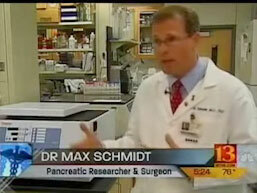 Surgery can cure patients with pancreatic cancer but this occurs rarely. Surgical cure is possible only when the cancer is detected early. Non-surgical treatment modalities have been largely ineffective. Pancreatic cancer thus represents the deadliest cancer. While a cure for patients diagnosed with pancreatic cancer is actively being sought, a significant difference can be made today by accurately identifying groups of patients at high risk of developing pancreatic cancer, screening them and stratifying their risk thereby promoting early detection and prevention. The mission of the PCC-EDC is to promote early detection and prevent pancreatic cancer through multidisciplinary screening clinics, registries, community outreach, education and research discovery. To view larger versions of the videos below, click on the YouTube logo. Video created by Eric Schoch. 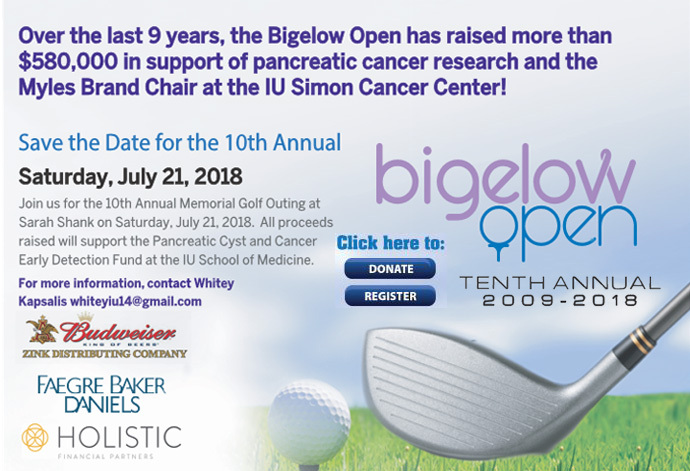 Peg Brand discusses the Bigelow Open and overall efforts to raise awareness and research dollars for Pancreatic Cancer Research on "WTHR Channel 13 Cares." An Indiana University cancer researcher has demonstrated that a particular molecule is present in the blood of most pancreatic cancer patients, suggesting it could someday be a diagnostic marker for the disease. ©2019 Pancreatic Cyst and Cancer Early Detection Center. All Rights Reserved. Hosted and Managed by Fedor Development Systems, LLC.